My last post said that on Saturday past I was embarking on the third of my 29 Lives as a DJ. Scrap that. It will happen but not just yet. 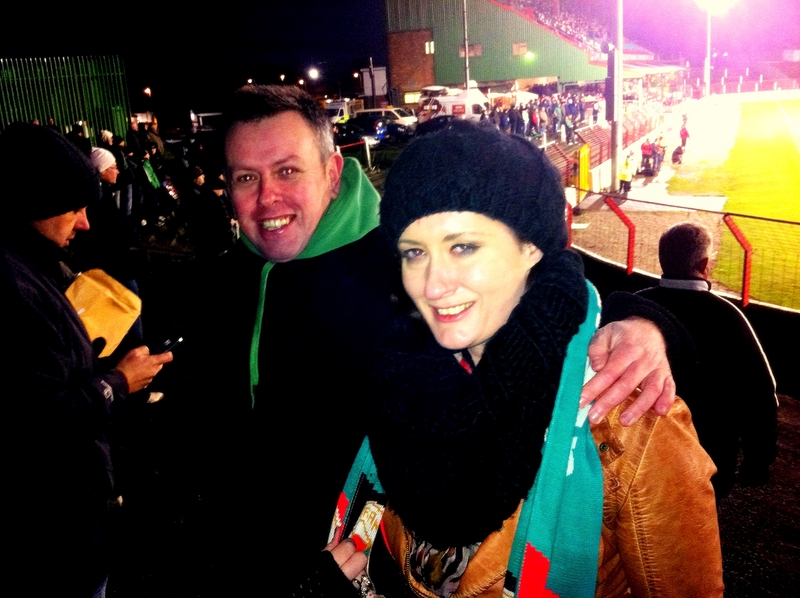 So, when my schedule changed at the last minute, I decided to take on another challenge – to live in the shoes of a Glentoran fan, and take a trip with long-suffering Glenman, DJ and twitter aficionado, Rigsy to their home ground, The Oval. Some of you might think this isn’t really a challenge. I beg to differ. I’m not a sports fan and I have a fairly long and protracted disaffection with football. It stems from two men in my life being extremely impatient with me and obsessive about the game. Firstly, my dad just didn’t have the will or want to explain how the game worked to my brother and I as kids. Secondly, my first boyfriend – a Reading fan – dragged me kicking and screaming to every game, home and away, back when Reading were a lot worse than they are now. It was enough to put me off for life. Until now. 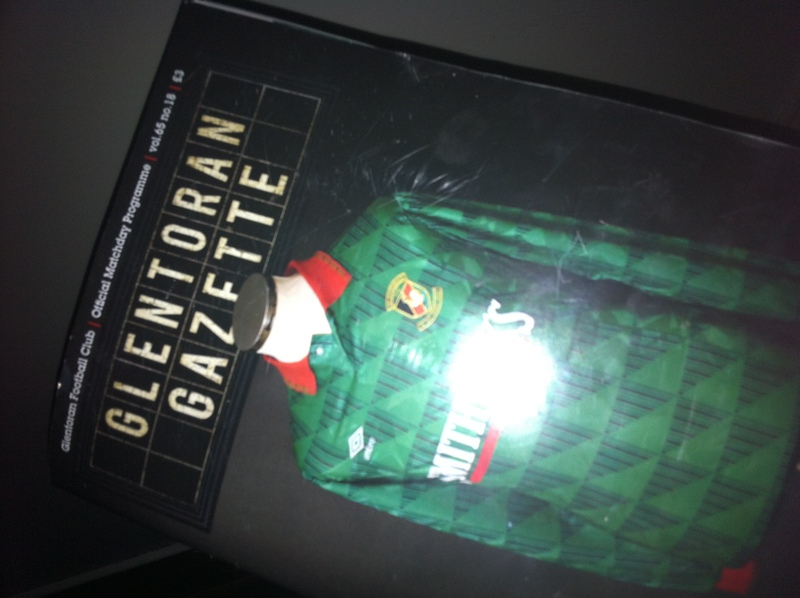 I could have picked a better day, a better time of year, or, in fairness, a better year to spend an afternoon in the shoes of a Glentoran fan. Things are fairly despondent in the Glens camp at the moment. Not long ago the East Belfast club narrowly escaped going bust following a vital cash injection from a mystery benefactor, and they’ve had a bad start to the season with a run of really bad results that have further dampened spirits. This, Rigsy explained, whilst talking at warp speed on the drive over to The Oval, has left a bitter taste in the mouth of even the most faithful fans and attendances have plummeted. Playing Portadown – who aside from Linfield are one of Glentoran’s biggest rivals – can often be a highly charged affair, at home and away. Rigsy recounted recent clashes where there have been post-game riots and fireworks thrown onto the pitch. There was no such furore on Saturday. Several police landrovers were positioned on the grounds but aside from the burger vans’ crimes against food, they had little to worry about. 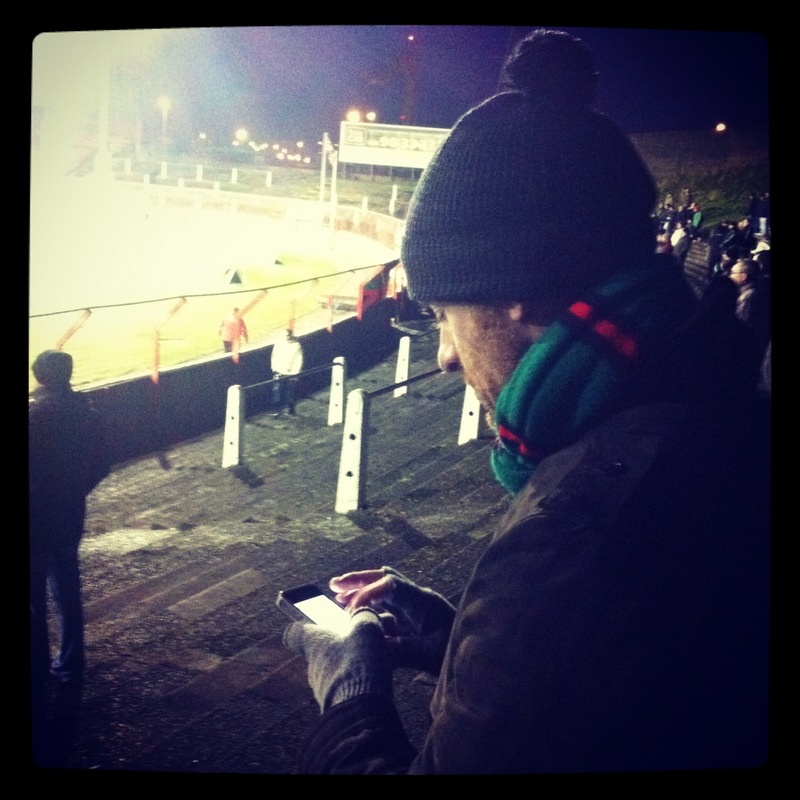 In the first half, we sat in the stand – Rigsy updating the official @Glentoran twitter account with match updates (of which there weren’t many) and me trying to follow what was happening without asking too many annoying questions, and perving on the players in the programme – the very impressive Glentoran Gazette. 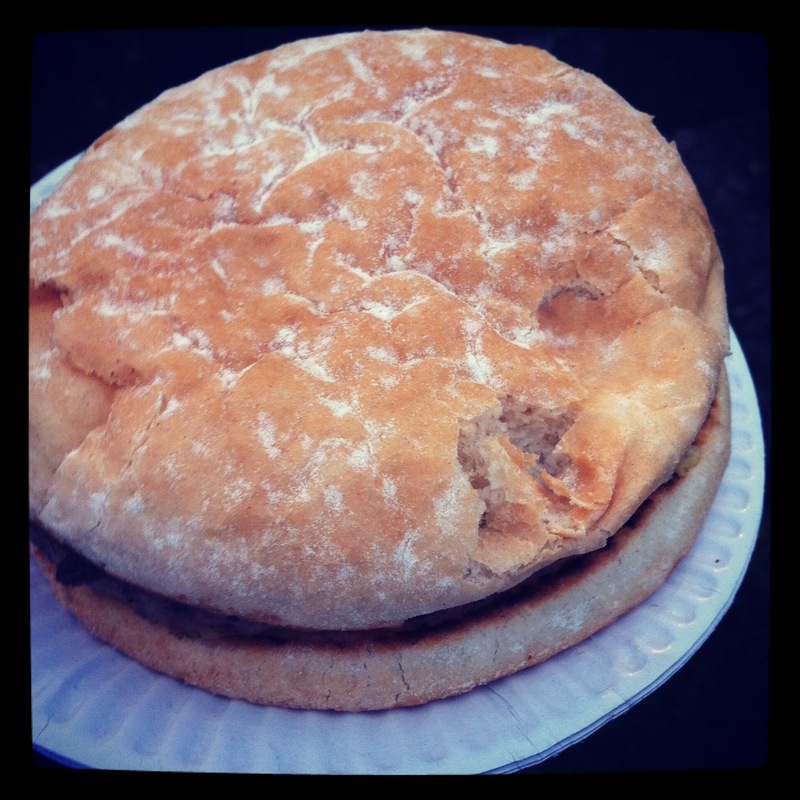 With the score still a fruitless 0-0, just before half time we made a dash for the aforementioned burger van – I’d been told via twitter that I couldn’t leave the Oval without sampling one of the burgers. There literally are no words to describe the experience – I honestly don’t think I’ll ever forget that acrid greasy taste. Never again. My tastebuds were not ready for this. My mood was somewhat lifted meeting a few of Rigsy’s fellow Glens fans at half time, including Sam Robinson – a fourth generation supporter and the brains behind the excellent Glentoran Gazette. 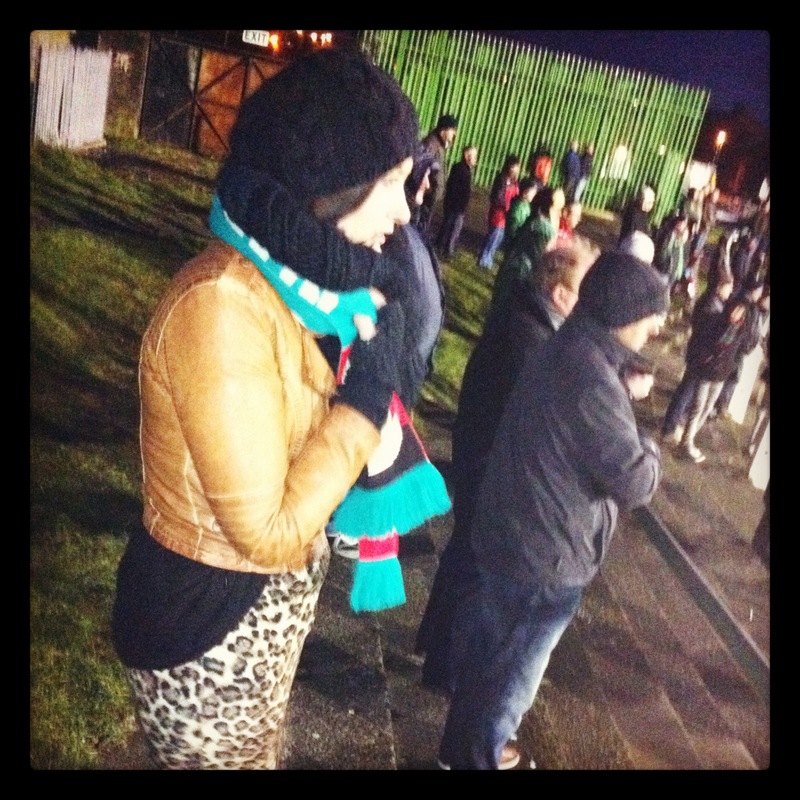 What, I asked him, brings him here week in, week out, in freezing temperatures to watch his team? “It’s in my blood,” was his reply. His grandfather was around when The Oval was bombed in the Second World War; East Belfast born and bred, he grew up streets away from the famed Glens ground and this is just what he does, every game, come rain, or shine. You’ve got to admire that commitment. Rigsy live-tweeting at the match. 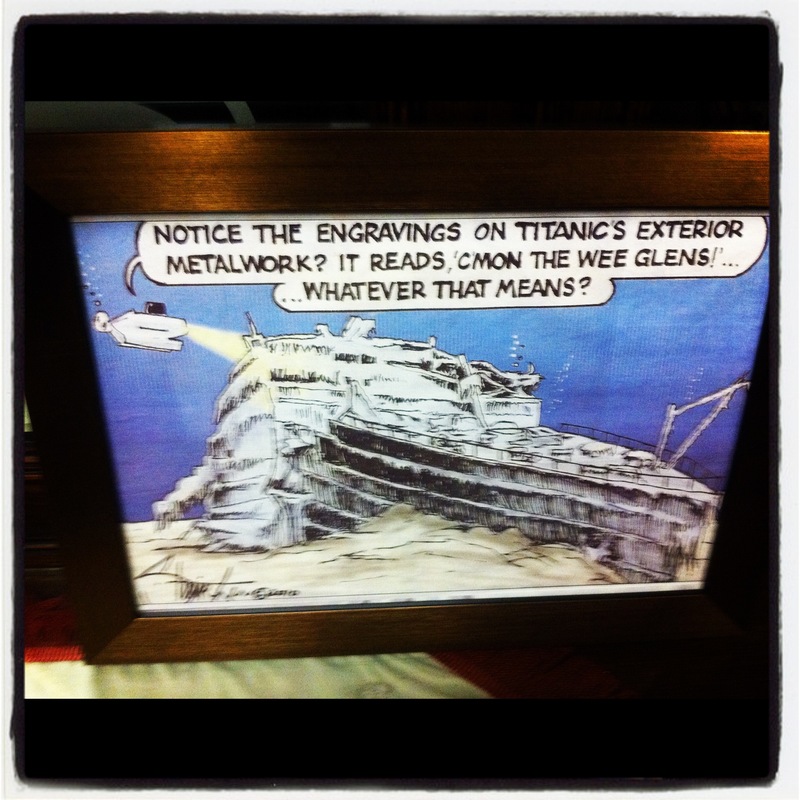 After a quick trip to the club room for a warming cuppa and Christmas cake, where I got the chance to see some quirky memorabilia including a picture of the late George Best back when he played for Glentoran in the club’s centenary match against Man United, and this gem of a Titanic themed picture, we stopped into the bar for a nosey. Some people pay their £10 in and watch the match in here. It seems a bit odd, but, in hindsight, after losing the feeling in my big toe to a near case of frostbite in the second half, I’m beginning to understand the rationale. When my cousins brought me along to Croke Park to watch Clare in the All-Ireland hurling final as a kid, there was a running joke that the Tipperary fans lunched on ham sandwiches on Hill 16. 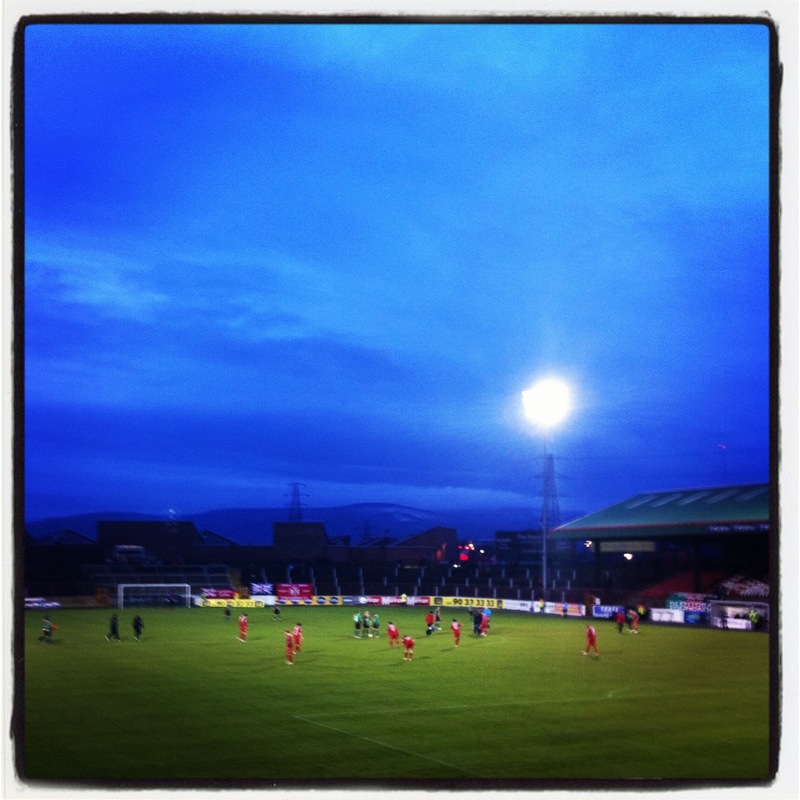 In the warmth, comfort and comradery of the supporters’ bar, a group of about eight Glentoran men were feasting on a picnic of cheese, tapenade, olives and sun blushed tomatoes – they clearly have more refined tastes. Rejoining Sam et al back on the terrace, we spent the second half with the sight of snow on top of the mountains on the horizon just adding to the feeling that you were about to contract hyperthermia. The match continued in much the same vein as the first half with no score in sight. Perhaps it was the cold sending me into a near comatose state but I felt myself losing concentration, brought back only by the banter from the boys, which included random chats about Weight Watchers success, my blog challenges, Rigsy’s attempts to single-handedly increase attendances, family and music – anything other than the dire game that was playing out before us. Then Portadown scored. And with just minutes to go, they scored again. It was a good day for Portadown, beating their rivals 2-0 on their own turf, particularly given the day marked their manager’s 25th year with the club. 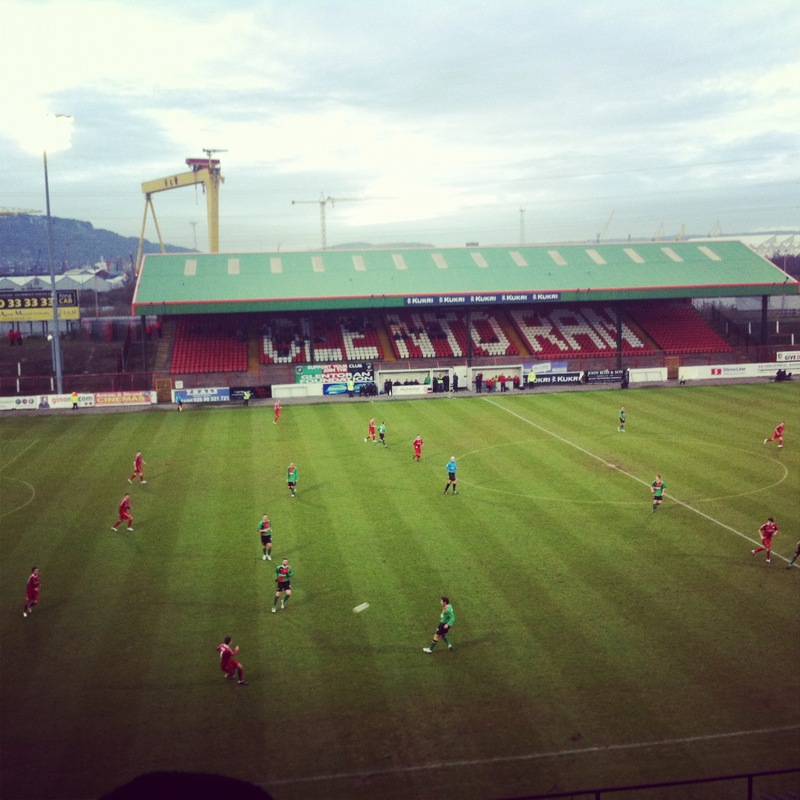 It was not such a good day for Glentoran. The frustration was palpable as fans started to leave before the match finished, shouting expletives at manager Scott Young as they made their way out. But even their cries were half-hearted – they’ve lost the will to even hurl abuse. I limped out of the Oval with numb toes thinking one thing – being a true football fan – not just an armchair fan but a true fan – is a bit like being married. You make a commitment, for better, for worse; for richer, for poorer; in sickness and in health. Unfortunately for Glentoran fans at the moment, things are almost at their worst, their club’s pretty poor and they’re all sick of it. I hope for their sake, and sanity, that they experience a rekindling of their metaphorical marital bliss soon. I was invited to tonight’s game at Coleraine – unfortunately I can’t make it but I will be back again sometime (perhaps when the temperatures increase slightly, or I purchase some thermals) – if only to provide some friendly moral support – god knows they need it. P.S. I’d like to go and experience some other sports as part of this ‘The Sports Fan’ challenge, so if you follow a team you think I should see, let me know! 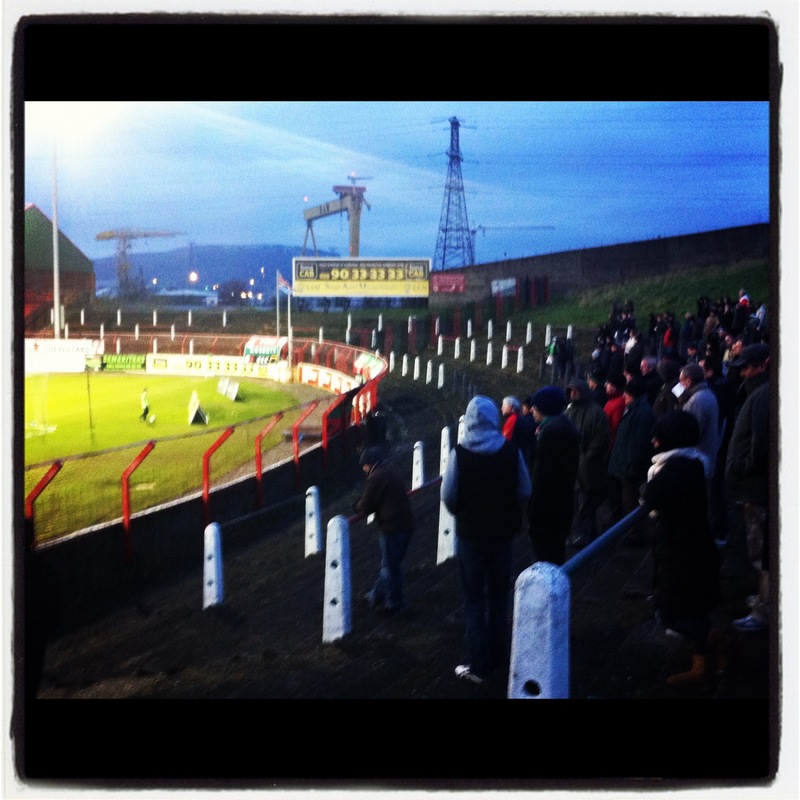 Also, Sam blogs at http://eastbelfastiswonderful.blogspot.com/ – it’s really worth a look. What about the time we brought you to see Ireland in Cyprus and you fell into a pile of barbed wire? Oh yeah… I forgot about that one – much like most of that holiday… You know, they haven’t let me out on a foreign holiday since!